OVER THE PAST YEAR, visual artists have responded to the steady clip of national news stories about unarmed black men and youth being killed by police. Titus Kaphur painted the Ferguson, Mo., protestors for Time magazine; Dred Scott wrote an essay titled “Illegitimate” for the Walker Art Center on the killing of Michael Brown; and Adam Pendleton‘s current exhibition at Pace London features new work inspired by the Black Lives Matter movement that has sprung up in reaction to the incidents. For his response, Kambui Olujimi (pictured below, at left) turned to Modern Painters magazine. “As a New Yorker, an artist, and as a black man, I grappled with these events emotionally, psychologically, and spiritually,” Olujimi confides in the May issue. To further explore his own feelings and discern the perspectives of other African American artists, he is conducting a series of conversations. 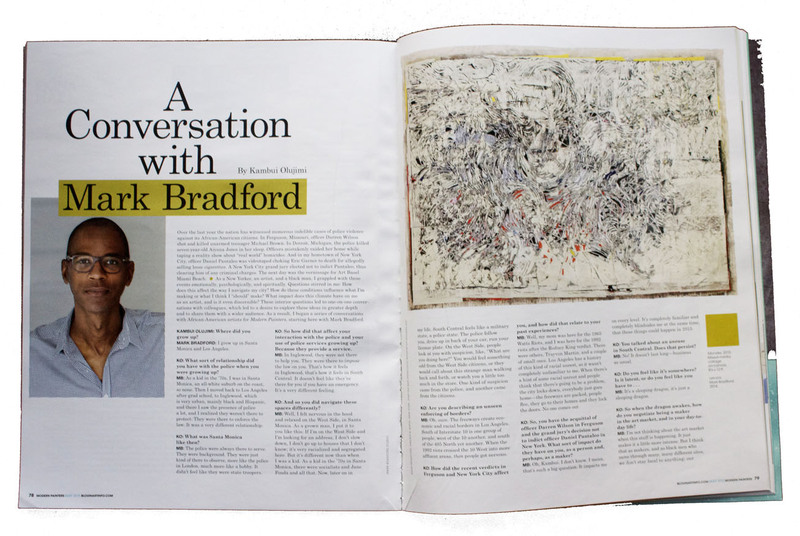 He inaugurated the project with a six-page feature (available in print only), an interview with Los Angeles-based abstract painter Mark Bradford who talks about his experiences with police and whether the spate of lethal incidents has affected what he makes.